In this guide we’ll take a look at the best looper pedals for guitar and vocals. You’ll be able to use any of these pedals for either on stage performances or home studio music production, or maybe just for practice to perfect your skills. Quick answer: Choose the Boss RC-30 for general instrument and vocal looping. But for guitars, the Electro-Harmonix 720 and TC Electronic Ditto X4 top of the class. In addition to the product overviews, we’ll also take a look at at a looper pedal is, and how one would go about choose the best one… since there are so many different types of looper pedals and loop stations on the market. By the end of the post, you should have a clearer and comprehensive understanding of looper pedals, and be guided to some of the best options out there. If you need help in choosing the best looper pedals for the money, take a look at the buying guide section of this post. The Boss RC-30 is a complete stereo phrase looping pedal for instrument and vocals. When it comes to being a one man vocal, instrumental, or beatboxing band, this pedal is impressive... it's actually the pedal of choice of Ed Sheeran and Dub FX. With 3 hours of recording time, you can record 2 separate tracks independently, so you can record a second track while your first track is playing, and fade between tracks with its dedicated faders. It has awesome effects that come pre-programmed, which you can add to the entire mix and use them musically. It also has guide beats programmed into it, as well as USB connection for sharing recordings between your music making laptop or computer. This is a fully loaded pedal with lots of great features. So it's particularly useful for musicians who want to expand their horizons creatively. 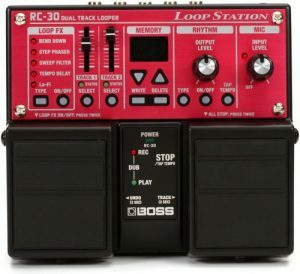 The Boss RC-30 is a floor operated looper with two pedal controls. On top of the 3 hours worth of recording time over 2 tracks, you can record a maximum of 99 musical phrases and loops into the unit's on-board memory storage for high-quality WAV 16/44.1 stereo. It includes effects such as bend down, step phaser, sweep filter, tempo delay, and lo-fi, which you can control either by the buttons found on the unit, or via an external pedal switch to switch and control your effects (use the onboard dual pedals to trigger your effects and loops). In addition to the faders, there is a microphone level input knob and level output knob for your rhythm guides. You can switch between types of rhythms, turn them on or off, or tap the tempo in via the buttons under the rhythm level knob. The indicators on the far left tell you which effect is being triggered when you turn it on or off, or changed the type of effect you want to use. To the right of you can select or deselect which of the 2 tracks you want to play under the track mixing faders. In the center is a large easy to read display that shows which loop you have selected in your navigation. You can connect two stereo instruments via the 1/4" TRS connectors at the back, as well as an aux input for your phone or tablet. If you plan on using a condenser microphone with the pedal, it has a very handy phantom powered XLR connector at the back for your XLR cables. And with it you can record vocals or loop percussions. As mentioned, you can take it another level and transfer the files into your digital audio workstation via USB to further edit your creations, or to add to your future performances. And thanks to its 6 AA battery power, you can take it anywhere without worrying about where to plug it in. The RC-20 is one of the more popular and recognizable pedals out there. It has a huge following, but particularly among instrumentalists and vocalists at the semi-pro to pro level. One bass player found that this pedal gave him the ability to perform live solos with his band while still having his simple bass-line playing. Another user found the unit "exciting," giving him the ability to fatten up his sounds by adding layers upon layers of loops with multiple instruments, taking his performances to another level. Finally, another person got it to help him learn his guitar by practicing over his loops. He found it gave him much needed enthusiasm to keep practicing thanks to all it can do. The Boss RC-30 is a got-to-have pedal for any instrumentalist or vocalist that wants to do more with their performances and recordings. It's a little bit on the advanced side, in terms of the amount of feature it has, but still simple enough that a beginner can get the hang of it in no time. 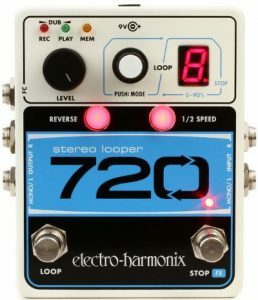 The Electro-Harmonix 720 Stereo Looper Pedal is another great band-in-a-box guitar pedal. With it, you can record layers of guitar playing and overdubbing, with lots of storage and plenty of looping time. All of that at a very reasonable price. Being a no frills, simple pedal to use, a beginner could get used to it in no time, as it does the basic job of looping. It has a small design that makes it fit with the other gear on your pedalboard easily - if there is one pedal that would be missing from your pedalboard, it might be this one. That said, let's look at the specs. The 720 was designed to be compact and foot operated. It has two footswitches at the bottom of the device. One is for recording, overdubbing, undoing, and redoing your loops, and the other is for stop. You can record and save up to 10 loops on the device, and loop 2 instruments at the same time. With the Loop knob/button, you can select which of the loops you want, with the digital display telling you which loop you are currently on. You can also access these 10 loops by an additional 3-button footswitch (not included). If you ever want to change the speed of your loops to half time (very handy) there is 1/2 Speed button for that. And the Reverse button will play your loops backways for interesting effect. The 720 is a stereo looper, which means it can handle stereo signals for balanced playback and recording. There are two instrument inputs for left and right, and another two stereo outputs for left and right. All four connectors are 1/4" TRS. It is powered by battery or power supply. The batteries it uses are 9 volt, and the power supply, which is included, runs on 9.6 volts. Most guitarists who have and use the 720 give generally very positive feedback on the looper. One customer said that "everything about the unit was great," It was simple to use and that's all he needed. Another commented on its "massive value," giving him the ability to create and write entire songs easily when he's not using it to play live or prep for a studio session. Finally, another customer found it "super intuitive" with the "perfect sound quality." I think you'll love this pedal. The money-for-value makes this unit truly one of the best guitar looper pedals out there. It does only one thing, does it a lot, and does it well. The TC-Helicon Ditto Mic Looper is another great low cost looper pedal if what you're looking for is a way to loop microphones. This is perfect for looping vocals and singers, but you can use it as an acoustic instrument looper as well for acoustic guitar, banjo, ukulele, percussion, etc. It's a very simple, very straight forward looper that does the very basic function of capturing loop phrases and looping them over and over. It's also super rugged, making it road worthy. The simple operation makes it easy to record, play, overdub, as well as undo and redo unlimited overdubs for your vocal and acoustic performances or recordings. In terms of specs, the Ditto Mic Looper was designed to be used by foot. There are two pedal switches, one for "stop" and the other for "loop." The main loop level can be adjusted by the large black knob at the top of the device. You get a total of 5 minutes looping time, which should be sufficient for your looping if you budget it wisely. The Ditto Mic Looper has one input and one output connector (XLR microphone connectors, each). To power the looper, you get an 12 volt power adapted in the package with your purchase . Unfortunately it is not battery powered (which is one of the few disadvantages users found with the pedal). The Ditto Mic Looper features an intelligent microphone input gain adjuster, so you can setup up your studio condenser microphones with ease. The preamp is also studio grade, high-quality, with low noise. And it even has a high-fidelity 24-bit audio DA conversion built in. For a cheap looper pedal, these are some really great features. It also has the ability to chain with other vocal processors and effects processors, particularly the TC Helicon effects pedals Harmony Singer and Mic Mechanic. Most owner who have the Ditto Mic Looper tend to be vocalists or acoustic instrumentalists. The feedback is generally positive. One user found it useful while performing as a street musician using a combination of junkyard objects and electronic percussions. He found it super simple and a no brainer to use. Another owner enjoyed becoming a "one man band" by creating bluegrass instrument loops and the vocals. The only general complaint was the loop time being only 5 minutes. The Ditto Mic Looper is one of the best cheap looper pedals you can find for vocals and acoustic instruments. It's also a great beginner looper pedal if you just want something simple, without too many advanced options to learn. Just plug it in and go. Fairly straight forward. The Boss RC-300 is considered the ultimate looper for multi-instrumentalists. With this pedal, you can connect your vocal microphone for looping vocals, your guitar for creating looped harmonic progressions, and a keyboard or percussion for bass-line and rhythmic loops. And that is just the basics of what it can accomplish. You can record up to 3 hours of loops, transport them to your DAW for further edits, and even sync your loops with the MIDI I/O. Add the on-board effects, plus its dedicated expression pedal, and you have a live music production machine that will turn your momentary inspirations into musical forms of art in every performance. Now for some specs. The RC-300 is a foot operated pedal rig that houses nine pedals in total. There are three pairs of pedals that controls three tracks. That means you can record and control up to three individual loops with unlimited overdubs. In total, you can save up to 99 loop phrases in stereo 16-bit/44.1kHz WAV audio. All of these files can be transported to your computer via the onboard USB cable, as well as import them back from your computer after your edit them in your digital audio workstation. For input, you can connect 2 instruments plus a mic thanks to the two stereo TRS 1/4" connectors, and the phantom powered XLR connection. There's even an aux 1/8" connector for plugging in your phone or tablet. It outputs to your speakers or mixing board via 2 1/4" connectors. The dedicated stereo channel pedal pairs control recording, playback, and overdubbing modes, as well as stop. There are two other master pedals at the top of the rig, flanking left and right. The far left pedal controls stop/start for all loops, allowing you to add musical pauses in your performances for emotional effect. The pedal on the right is your standard effects pedal, allowing you to trigger any of the 12 onboard effects for any single track, or the entire mix if you'd like. This will give you lots of creative expression to play with. The far right pedal is a large expression pedal, which takes what a "looper pedal" is to another level, allowing you to bend and control the effects parameters in real time for hands-free creativity. The RC300 also features Loop Quantize, which will snap your loops in time to minimize any rhythmic inconsistencies in your loops. There are also loads of onboard guide rhythms to assist you into a groove, from rock, pop, latin, to shuffle, and more. And there is an audio bank of backing tracks that contains bass, piano, and other instrumental tracks for you to follow. If you want to adjust the tempo, you can tap it in, with a specific time signature of your choose. Even when you save the phrase, the time signature will be saved in the data as well. As you'd expect, the general user feedback is overwhelmingly positive. The typical owner is, as mentioned, a multi-instrumentalist and vocalist. One owner said that he found it to be a great composition, jamming, and performance tool. Another customer said that he's always had a looper on his guitar board, but since getting this, he's never glanced back at his old looper. The Boss RC-300 is the favorite looper pedal on this list. It is also the most expensive, but not crazy expensive. It's just right if what you're looking for is a complete loop station pedal for your multi-instrument performances and live productions. The Boss RC-300 is the most popular and most recommended in its class, and certainly the best looper pedal there is for what it can do. Outputs: 2 x TRS 1/4"
TC Electronic Ditto X4 is a four-pedal guitar looper that acts as two looper pedals in one. It has the ability to create two individual loops that can operate either independently or simultaneously with the ability to add effects. 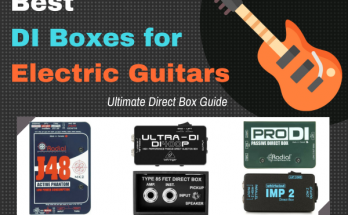 For this reason, it's one of the most flexible and popular guitar looper pedals out there, used by tons of professional guitarists and instrumentalists. 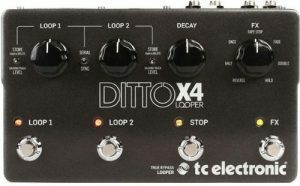 It was created as the upgrade to another very popular looper pedal, the standard Ditto Looper, but due to requests, TC Electronic came out with this really great unit that offers some well needed features that the basic guitar pedal tends to lack. That, plus its very high quality design, makes this one of the best guitar looper pedals for the money. The Ditto X4 features the ability to apply true-bypass switching, which allows you to preserve the original tone of the loop. The loops can be created in stereo, thanks to the two pairs of left-right I/O TRS 1/4" connectors on the device. The stereo connections can give you some flexibility as well when it comes to routing options. There are a total of 7 loop effects for you to play with, including tape stop, reverse and hold, which you can switch between from the knob on the far right of the unit. The other three knobs control the loop volumes for loops 1 and 2 (independently), and decay. Then there is a switch in the middle of the loop knobs for looping in either serial mode, or sync mode. With all that, if you find that you can't get your creative juices flowing, there's even an extensive library of backing tracks provided by JamTrackCentral that comes with your purchase. The Ditto X4 is a guitar looper that was created for guitarists. So it stands to reason that the vast majority of people who get this would be guitarists. The customer reviews from guitarists are overwhelming positive. One user said that this was "more than a looper" with its functionality allowing him to expand his creativity "on an exponential level." Another customer commented that he found the interface effortless to navigate, with workflow as "smooth as silk." TC Electronic Ditto X4 is a great pedal if you're coming from a basic pedal and looking to "upgrade" to something with more functionality, flexibility, and power. This pedal was created as a demand made by many guitarists for the extensive looping capabilities -- an improvement upon their very popular basic mode. So most likely, you'll find everything you need, and more, in this looper pedal. The Boss RC-1 is a good cheap looper pedal for beginners. It is a simple, straight forward looper pedal that does the basics of what you need, without a lot of features for you to try and learn to figure out. Just plug in your guitar and go. For this reason, it's also perhaps the best looper pedal for beginners. It has simple to operate functions of recording, playback, overdubbing, with undo and redo capability, just in case you need to redo a faulty phrase. Its best use is as a guitar looper pedal, hooking up to your electric or acoustic guitar (via instrument cables). But naturally, you can use it with another instrument like bass guitar, digital keyboard, or as a beatboxer. The RC-1 is designed to be foot operated. It has one pedal switch, with the instructions "STOP" when you tap on it twice, and "CLEAR" when you press down and hold for more than 2 seconds. There is also a knob for your audio level, and a circular loop indicator for duration. It lights up green when playing your loops, red when you record. 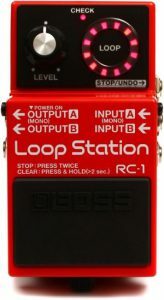 You get a total looping time of 12 minutes with the RC-1, which is plenty more than many others in the market (usually just up to 5 minutes). The RC-1 also has stereo inputs, with two TRS 1/4" connectors to plug in your left/right channel for stereo looping. This is especially good for stereo amp rigs and instruments. There is also a stereo output using, again, 2 TRS 1/4" connectors. To power it, you have two options: 9 volt battery, or a power adapter. The 9 volt battery makes it great for setup, as you wouldn't need to find another spot on your power rig to plug it in. However, the power adapter doesn't come included in the package. The RC-1 also features an option to use a external footswitch, which makes using it on stage more flexible. The device (FS-7) is not included in the package, however, but it's good that you have that option for when you grow beyond the basic design. Another cool feature is the fact that the last phrase you recorded doesn't erase when you turn it off. This makes it excellent for coming up with, and building out, song ideas when you're on the go. Most users who've had the pedal praise it for its simplicity and ease of use. A lot of people who get it are simply beginners to the world of looping, whether they be expert guitarists or novices. One owner said that it's not only very useful, but extremely addictive. He found that it turned out to be a great songwriting tool for him. Another said that once he got this little pedal, his other band mates became jealous. The Boss RC-1 is a great jamming tool and performance gear for guitarists and instrumentalists of any kind. It's also a super cheap looper pedal. So if you're just getting into looping, and don't want to invest in one of those more advanced units, but want to get professional and reliable results, this could be the best looper pedal for you. Inputs: 2 x TRS 1/4"
The VOX VLL1 is an affordable guitar looper for loop musicians that want a little more power than what a basic looping pedal can do, but for cheap. It has the ability to create two independent loops, combined with a dozen effects. Its design makes it suitable for being placed on your pedal board, but with enough features to warrant it being the only device you'd probably need for performances or recordings. This is essentially a band-in-a-box device, which allows you to loop not just your guitar, but any instrument you like that you can mic - percussion, vocals, whatever, with lots of overdubs to create your own musical arrangement backing band. The VLL1 (also call Lil' Looper) is compact for what it can do. It has two pedal switches which is operated by foot. The pedals are labeled "LOOP1" and "LOOP2" respectively. To record, play, or create overdubs, you simply press once. To stop your loops, press twice. To undo faulty loops, press and hold. There are helpful light indicators at the top to show you whether you are in record mode or playing mode. There is are also Auto Record mode, which will auto save your playing and keep your ideas for those times you're just jamming. In metronome mode, you can use it to record chords or percussive elements in proper timing, and then loop your solo over it. You can even adjust and create new tempos by tapping them in on the Tap button. And the "Effect" light changes color based on what effect you've selected. The VLL1 connects to your instruments via two 1/4" TRS connectors, one for instrument, the other for microphone. There is one output, a 1/4" TRS connector. It is powered by 6 AA batteries, which comes included when you purchase the looper. You can also power it via adapter, which is not included. The total looping time is 3 minutes for 2 loops with unlimited overdubs. The effects include overdrive, stutter, distortion, delay, chorus, and phaser among others. Most owners of the VLL1 are very happy. Users found it easy to use and setup, even though it goes just beyond what a basic guitar looper can do. One user said he didn't even bother to read the manual as it was so easy to use and it was self explanatory. His only complaint, a valid one, was the lack of an XLR connector for mic. A next user said that, despite being worried about the low price, he was pleasantly surprise by the high quality sound and performance, plus solid design. 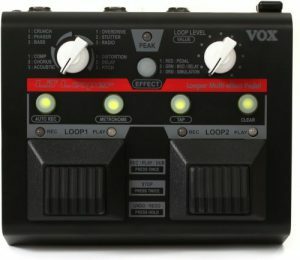 The VOX VLL1 is a great affordable pedal for doing pro loop music performances and recordings. It doesn't have a microphone connector, so if need to connect your microphone, you'd either need an adapter, or to choose another looper in this list. Otherwise, it has lots of great features and effects, and at this price, it's hard to turn down. 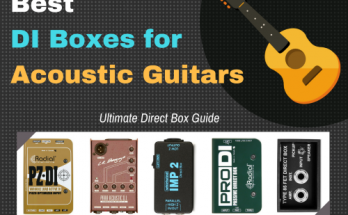 Outputs: 1 x TRS 1/4"
If the other pedals mentioned in this guide could be called "band-in-a-box," the Boss VE-20 could be called "vocal-quartet-in-a-box." This looper pedal allows you to loop your own vocal phrases. But in addition to that, there are some other very cool features. You can create 4-part harmonies to make it seem like you have backing vocals, and add cool ambient effects to your vocal performances with just the switch of the foot pedals. There's even real time pitch correction, which vocalists would find very valuable in a pedal. Plus it's suitable for any genre or style of music, doesn't matter what you sing. It's also very simple to operate, as it was designed specifically for vocalists, making it a unique addition to this list. The VE-20 is designed to be operated on the floor by foot, with two foot controls for you to start/stop phrase loops, record, and add effects. There are seven buttons above the pedals, which you'd use to navigate the menus and select your presets, and effects. There are 30 factory FX presets in the pedal, each designed for a particular genre. Plus, you can add up to 50 of your own presets. The effects include modern sound distortion, radio sound, and strobe for your voice. All of these are selectable by the pedal. There is a total phrase looping time of 38 seconds, which is a bit of a downside. If you budget your time wisely, though, it should be enough for recording vocal chorus phrases and hooks. The VE-20 connects to your microphone via the combination TRS/XLR connections, which means there's a flexible choice in how you choose to mic your looper (use XLR for mono or TRS for stereo). If you have a preference for condenser microphones, no worries, there is phantom power, so there will be no need for additional setup gear. The VE-20 also has two outputs, both are XLR L/R channels for balance stereo output to your mixer. It is powered by either 6 AA batteries or AC adapter (not included). This is a very popular vocal pedal among vocalists. The vast majority of users who got the VE-20 are very satisfied with it. One owner, a lead vocalist in a metal band, said he could tell the sound guys to leave his signal flat. With the preamp and effects built into the pedal, he could do it all himself, and so had better creative control. Another customer appreciated the fact that it doesn't rely on instrument "reference tones" to set up the harmonizer and FX to play in tune. Something that many other vocal pedals lack. 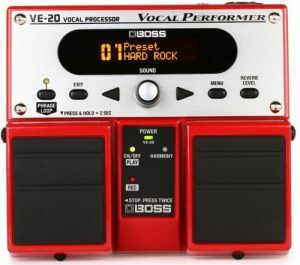 The Boss VE-20 is perhaps the best vocal pedal out there for the money. It's any singer's dream to get the right vocals, effects, and backup for their solo or group performances. With this you have the power and control at your feet. If you're looking for a looper pedal for guitar, with powerful time based effects, and at an affordable price, check out the Electro-Harmonix Canyon Delay and Looper Pedal. Even though it's small, it has enough features packed into it that would normally require more than one pedals in your signal chain. If you know you're going to need delay and reverb in your guitar performances and recordings, but don't want to fill up your pedalboard with too many pedals, this Canyon can be your all-in-one space saver and looper. The EHX Canyon has a fairly minimalistic but beautiful design. There is a single foot switch at the bottom, plus four knobs that control FX level, delay, feedback, and one that allows you to switch between 11 modes. These modes are ECHO, for digital delay; MOD, for modulated delay; MULTI, for multi-tap delay; REVRS, for reverse delay; DMM, for Deluxe Memory Man-style analog delay; TAPE, for tape delay; VERB, for reverb plus delay; OCT, for octave delay; SHIM, for shimmer effect; S/H, for sample and hold; and finally LOOP, which places it in looper mode. The looper mode itself has a maximum loop time of 62 seconds. To operate any of the features, simply switch to the effect or loop, and tap on the foot switch while you perform your solos or riffs. You can easily switch between effects and loops on the fly, with the ability to start, stop, overdub, and erase your loops if you like. The EHX Canyon also features a Tap/Divide button between the knobs which you use to tap in your tempos. 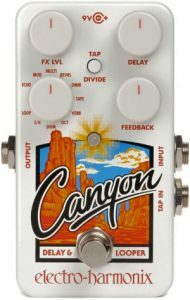 The EHX Canyon has a single instrument input and one "tap in" (both TRS 1/4") connector. The looper will output via another TRS 1/4" connector for your amp or mixing board. It is powered by a 9 volt DC power supply which comes included. It's not battery powered, however, which is probably the main downside. The EHX Canyon seems to be the preferred looper among worship guitarists, as well as other guitarists whose style leans more toward "ambient" playing. One user said that his first 15 minutes ever using the Canyon after he received it was exciting, it really got his creative juices flowing. Another user found it to be his all-in-one pedal, which was "well worth the money." Finally another owner found the potentials of the Canyon to be "amazing unlimited," saying that it will take weeks to really get the best out of this pedal. He particularly liked the "auto-save" feature on the looper, as well as the high quality analog delay effects. The Electro-Harmonix Canyon Delay and Looper Pedal is pretty good little pedal. It's affordable, and has a lot of great features for its size. If you're more into getting a lot of effects, with the added bonus of loop capability, this is a pretty good option. 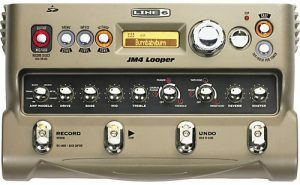 If you're a guitarist looking for a virtual band to perform and create new songs and work out new musical ideas, take a look at the Line 6 JM4 Looper Pedal. It's a looper pedal + backing track unit. With its on-board storage, you get 100 pre-recorded backing tracks recorded and performed by top musicians in the music industry. There's 24 minutes worth of guitar looping, plus seven "Smart Control" effects, almost 400 presets, an integrated tuner. There's also a choice of 12 amp models for your guitar. All of that equals to a very looper pedal that you can find for personal use, practice, and even performances. The JM4 is a floor operated unit that has four footswitches to control the various functions: record/overdub, play/stop, half speed, and undo. You can control the tone of your loop via the bass, mid, and treble tone controls. You can also add delay, reverb, and compression to vocals or another instrument via the independent microphone/aux input. Being the ultimate backing track looper, it has four inputs for different kinds of audio sources you'd want to draw from. These are the instrument TRS 1/4" connector for your guitar, then the TRS 1/4" for aux, and XLR connector for your mic (which has a dedicated trim knob), and a 1/8" input connector for playing tunes from your phone or tablet. And you'd find the outputs very sufficient, as there is output for your headphones, for your guitar amp (mono), and stereo output for the entire mix. As mentioned, you have up to 100 Endless Jam tracks and drum grooves for your inspiration, but you can also load up to 6.5 hours more jams of your own. You can do this via the 2-GB SD card slot in the back. The SD card is not included, as to be expected, but it is a good thing to have once you start coming up with ideas on your own. You can choose between which amp model you like, from blues, twang, crunch, clean, metal and "insane," with a drive knob to dial in the amount of drive you need. The majority of users who purchased the JM4 provide positive feedback. One user said that it was the single best tool he ever used to improve his playing. It was like "sitting in with studio musicians... your 'vocabulary' will go through the roof." Another owner found that the quality competed with the other professional level gear he had in his home studio. The Line 6 JM4 is one of the best guitar looper pedal for beginners and pros alike. If you ever found that getting your band to practice your songs was a task, and you wanted something to carry with you for your own solo performances on guitar or even vocals, check this out, it might be a lifesaver. Loop music performance and production is one of the most interesting and amazing ways to make music for yourself. If you've ever seen it in action, you've definitely been affected by the particular sort of energy and ambience that live loop performances can create. One of the most phenomenal things to experience as an artist, or audience member, is witnessing a piece of music growing and taking form in the moment -- and that's what a looper pedal allows you to do. Even if you don't plan on seeing the stage much, loop pedals have gained the reputation of being one of the best practice tools for students and amateurs. With a loop pedal, you not only have the opportunity to create your own backing tracks live for performances and recordings, you can also use them to practice your timing, rhythm, intonation -- looper pedals are an honest, accurate, and impartial judge of your own playing. In fact, one of the most popular customer reviews is of people saying how much their playing has improved since using a looper pedal. A looper pedal allows you to record short snippets of your playing and play them over and over again without any gaps. This allows you to perform over your own musical ideas, like you would jam with another guitarist or keyboardist. The main function of the pedal is that it is operated on the floor. There is either a pedal or a "stomp box" which you trigger with your foot to record, overdub, play, or stop your tracks. Some loopers allow you to do all of that with just one footswitch, others use two foot switches. But the general idea is that your hands are free to play guitar or another instrument, or to hold your microphone if you are singing on stage. For example, you can record a basic chord progression for your song, either for performances or for practice. When you stop recording, it continues to loop back the chord progression so that you can play a bass line to it. You can also record that (or "overdub"), loop it on top of the previous chord progression, and then record your melodies. That is essentially what a looper pedal does, at its most basic function. Of course, there are more advanced options. 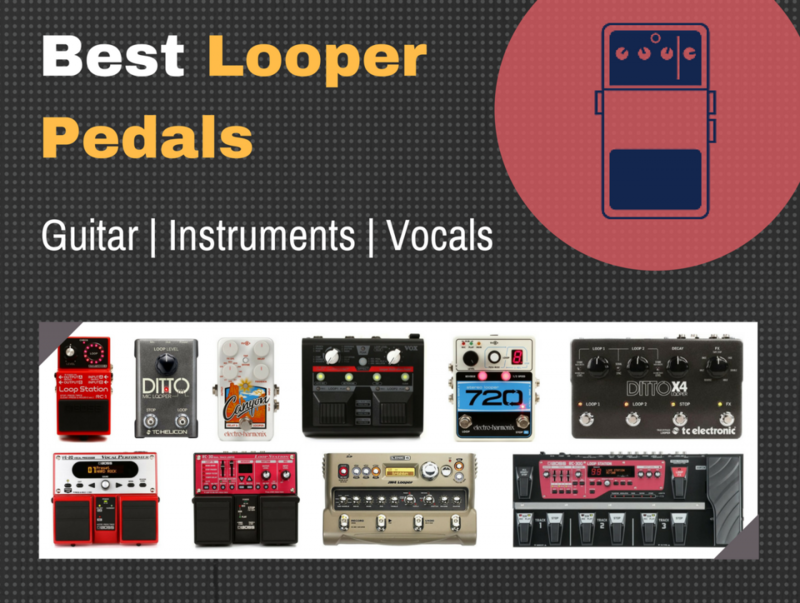 You can choose a looper pedal with effects, or one designed specifically for guitar or voice. There are even looper pedals that are designed to record loops for up to three instruments at the same time. With that in mind, we can place looper pedals into three main categories. Let's go over what these categories are together, one by one. Like the name suggests, it will have the capacity to record and loop your tracks, at varying loop durations (more on that in a bit). They won't consist of many effects, if any, as their main duty is to sound good and make you sound good. But even in your basic looper there are some advanced options to choose from. You can get a basic looper which has the capacity to record two simultaneous tracks. Or you can record multiple instruments at once. The very basic looper pedals are best for beginners, since they are easy to use, and don't require figuring how to use the other advanced features. Mic looper pedals have also been very useful for acoustic instruments. Many acoustic guitarists and brass players find excellent use for looper pedals for creating harmonizations. If your instruments require to be miked, these are the loopers to go for. There are many other loopers, however, that offer both instrument connector and mic connector, so you have a few options. Like the name suggests, some of these looper pedals are both FX and looper pedals in one unit. The beneficial thing about these pedals is that you get to minimize the amount of room you use up on your pedal board. One FX/delay looper pedal can do the job of two pedals. With what we've discussed about the may types of looper pedals, let's say you're a bassist, and you've decided to go with a looper pedal that has some effects on it. Perhaps you want to lay a standard bassline, but be able to solo over it while performing in a band. There are few more criteria to keep in mind before you move forward with your choice. This is an important factor. Depending on the kind of music you're playing, you might need to keep in mind how long a loop each looper pedal can allow. If you plan on looping 16 bar blues guitar chord progressions, you may need something that can record loops of more than just a few seconds. Additionally, there is a "total loop duration time" which really means the amount of accumulated loops you can save up. Add up the numbers to know how many loops, and how long, you will typically need. Loopers have a maximum number of loops that you can record. The most basic looper will allow you to record only one loop, and then you can overdub that loop with a series of other loops. This is what we normally think of when we consider a looper pedal. But what if you need to record two different loops? For instance, you record one loop for a certain song section (verse) and another for another section (chorus). Both of which you can overdub and switch between. A basic looper won't allow this kind of functionality. We just touched on this. Overdubbing simply means the ability to record a loop on top of another loop. Many loopers give you an "unlimited" amount of overdubs. If you want a technical explanation, you can check out the Wikipedia article on overdubbing. If you plan on doing any multi-instrument looping, or singer-with-a-guitar looping for both vocals and instrument, you'd need a looper pedal with more than one type on input - both instrument and microphone. Read further: Best Instrument Cables, Best XLR Cables, Best Studio Mics. Some of these looper pedals come with their own power supply. Others are battery powered. Battery powered loopers have the benefit of being easier to setup because there's one less real estate on your power strip to worry about. However, keep in mind that some of the battery powered loopers don't come with their own power supply, meaning you'd have to order one with your purchase if you plan on getting a battery powered looper. Some loopers have the ability to connect to your computer or laptop to transfer files back and forth. There is also the ability to connect via MIDI I/O for beat synchronization and quantization with your music. These are found on some of the more full featured loopers on the list. That pretty much covers the essentials of what you need to know in choosing the best looper pedal. Keep these tips in mind, and you'll find that getting a looper pedal is an easier and less time consuming task than you might've imagined. As you may have realized, you would've learned what a looper pedal is, why it's so popular, and how it may be of benefit to you. 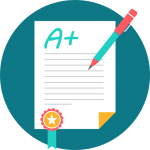 You would've also looped over the information and specifications for each of the products that are recommend in this guide. From the table at the top of the page, you would easily draw a comparison between each looper pedal, which would've made making a decision far easier for you. Our hope is that you came to your own conclusion. Even if the one you ended up buying is not on this list, but another recommendation from Amazon, you at least know what's the right one to get. On the other hand, if you're a pro, this guide would've been just a quick selection process for you. Please feel free to share this post with your friends on social network or email. If you found it useful, or think someone else will find this information helpful, share the love with them! How we came to these results? This is the result of many hours and over a week of researching online how to find the best looper pedals out there. The sources user were mainly online music gear stores, and pro audio forums. The list was compiled from the best rated and most popular loopers. 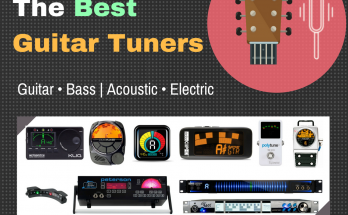 Also, daya was compilated from user reviews, product reviews, and organized and categorized the best looper pedals based on their price point to specifications ratio. The result is a list of awesome looper pedals for practically any application you can think of, whether beginner, or advanced, for guitar only, or voice, or multiple instruments. If you know what you want, you will the best choice here. Previous Article Closed Back vs Open Back Headphones for Mixing – Which is Better?